Talking about what is expected for the Saturday fight between the super Champion Danny Garcia and Challenger Mauricio Herrera is more of the same, because when the Puerto Rican descent champion is in the ring there we always expect to see a hard fighter, and puncher. For many, Garcia became known after he fought a warrior like Lucas Mathysse as hard as God mandates, last October in Las Vegas. However, the undefeated WBA 140-lbs super world champion (27-0), was already known. 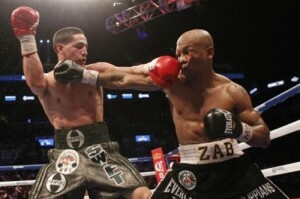 Zab Judah, Erik Morales, Amir Khan and Kendal Holt are some of the names he left on the way the Philadelphia native. However, fighting in Floyd Mayweather’s undercard made people notice him, and García seized the moment. What can be taken as a fight of the year, Garcia gave and took in the fight what in my opinion was the best of the night at the MGM Grand. Without lowering his guard, the solved any situation and invited Mathysse to war. It speaks for Garcia as a boxer. He has the spirit, the hunger that many people speak about but few see. That instinct of a native puncher that never let go his opponent until he sees them destroyed or until the referee to intervenes. In particular, that is what I like about the American. He never gives in; he does not get tired, knocks out and box. So far, it has not avoided a fight, and plans to go slowly. No rush, no push. Seeing Garcia fight is a pleasure. In General, he makes those fights that every fan enjoys, those fights that makes one question those who say that boxing is dead, or there are no champions like before. Garcia has a lot of those from the past and also his own that makes him what he is now.